Laurel Street Flowers is located in St. Paul. Our address is 1138 St. Clair Ave., St. Paul, Minnesota 55105. Our phone number is 651-221-9700. Laurel Street has an established history in St. Paul – originally located off of Laurel Avenue, we moved to Hamline Avenue in 2009 and recently moved to a studio site on St Clair Ave. We have been serving St. Paul, Minneapolis and the suburbs for 28 years! Laurel Street Flowers shop hours are Monday through Saturday: 10:00 a.m. to 4:00 p.m. You are able to place orders online twenty four hours a day! We prefer scheduled appointments for wedding flower consultations. 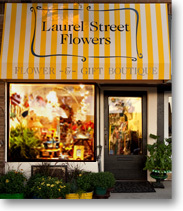 At Laurel Street Flowers, we provide complete floral design services from our new studio. We specialize in beautiful and unique arrangements, delivered daily, and are known for our stunning weddings! We also offer permanent botanical designs for your home or office. You will need to be a registered user on Google. If you are not, you can register here, Thank you.